How beautiful is this tart? 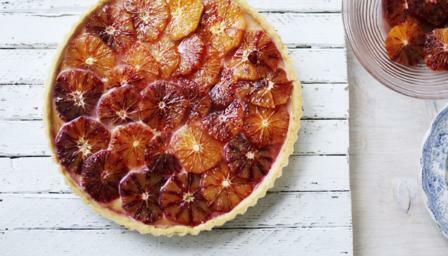 The season for blood oranges is short, so don't miss the chance to try this. Whisk the sugar, orange juice and zest, orange blossom water, eggs and egg yolks together in a bowl until well combined. Cook for 15-20 minutes, stirring regularly, until the butter has melted and the mixture has thickened. Pour the mixture into the cooked pastry case , cover with clingfilm (to prevent a skin forming) and set aside to cool. Arrange the orange slices on the cooled tart and sprinkle over the demerara sugar. Using a cooks' blowtorch, heat the sugar until caramelised. To serve, slice the tart and serve with double cream or custard.